The Creative Soul School of Music Keller/Watauga location offers exceptional music lessons for an array of music lessons. What instrument do you want to learn, guitar, piano, voice, drums, bass guitar, or violin? 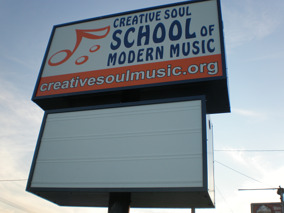 Whatever instrument you want to learn Creative Soul in Keller/Watauga has an instructor and a lesson plan for you. Located near the intersection of Watauga Rd and 377. Big Blue Building--can't miss it. Check out our amazing instructors!